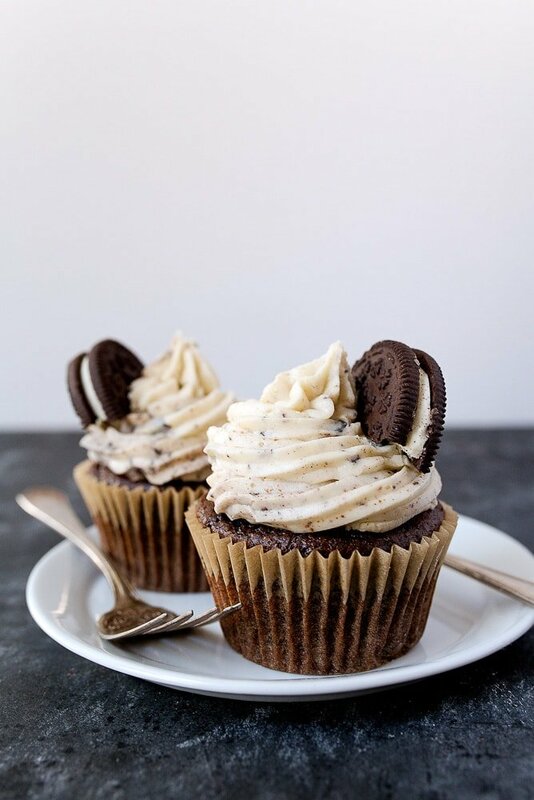 Cookies and cream cupcakes (small batch). I’ve been keeping a secret from you. I’m sorry. I know how to make buttercream that tastes exactly like the inside of an Oreo, and I haven’t shared it with you, until now. Part of the reason is that we eat this cookies and cream frosting straight out of the bowl, and then go back to our normal lives like it never happened. It’s best not to dwell on such moments. 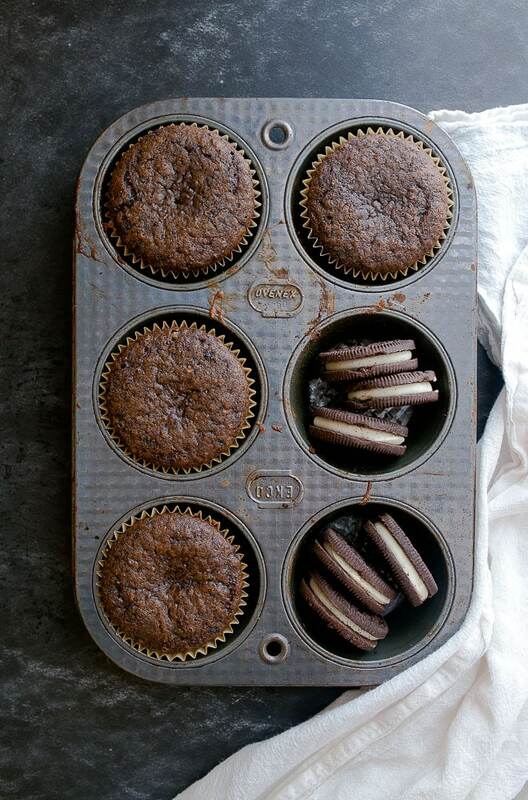 But, the other reason is because it’s harder than you think to save 4 Oreos from the box with which to make cupcakes. I start by adding 4 oreos to a little bag as soon as I open the box. And then somewhere between 9pm and 9:15 (the first few minutes after I put Camille to bed–aka freedom! ), the Oreos, dude, they start calling to me. And so I eat them to shut them up. And then I have no Oreos with which to bake. I saved these Oreos by burying them in the onion bin at the bottom of my pantry. True story. I really hope my husband doesn’t read this, because the onion bin has been my dessert hiding place for years now. 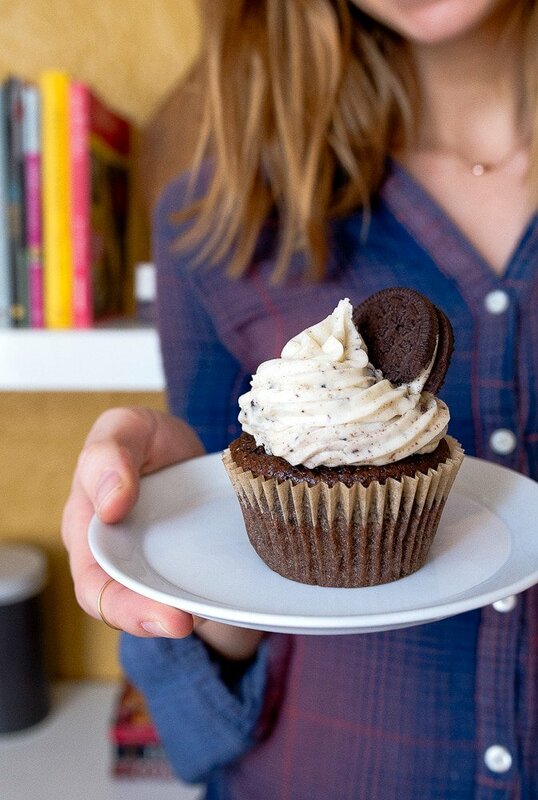 How are we feeling about 4 cookies and cream cupcakes serving 2 people? It’s reasonable, right? My husband can eat 2 in one sitting. I only eat 1, but that’s because I’m up to HERE in sugar all day long. Also, I most likely ‘cleaned’ the frosting bowl with my face earlier in the day. It’s amazing how much trouble we can get into with just 4 little Oreos, isn’t it? Whisk together your wet and dry ingredients separately, and then add the wet to the dry. This will keep you from over-mixing the batter. Use unsweetened cocoa powder for this recipe, and make sure you slightly heap it above the measuring spoon. yes, this means you’re getting more than exactly 2 tablespoons of cocoa powder in the recipe, but cocoa behaves a bit like flour in a recipe, and it will be fine. 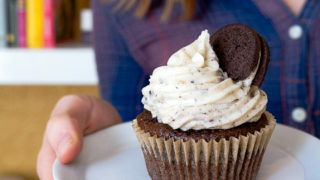 The smaller you crush the Oreos when making the buttercream, the easier it will be to pipe it from a piping bag. If you want big chunks of Oreos in your Oreo buttercream frosting, then skip the piping bag and frost your cupcakes with an offset spatula. A small batch of Oreo cookies and cream cupcakes. Preheat the oven to 350, and line 4 cups in a muffin pan with paper liners. In a medium-sized bowl, whisk together the flour, cocoa, baking soda, baking powder, and espresso powder (if using). Next, in a small measuring cup, whisk together the buttermilk, oil, vanilla and brown sugar very well. Add the wet to the dry, and stir until just mixed. Divide between the cupcake liners and bake for 16-17 minutes. They're done when the tops spring back when touched (if you under-bake, they'll sink). In a small bowl, beat together with an electric mixer on HIGH the butter, powdered sugar, heavy cream, and vanilla. Beat for 1 minute, until very fluffy and light. Finally, stir in the cookies by hand, crushing them as you add them. (I went a little light on the cookies so the frosting was more photogenic, but the frosting tastes best when you add all 4 cookies). Frost the cooled cupcakes with the frosting and serve. I’m feeling good about 4 cupcakes for 2 people. So good :) But seriously, these cupcakes look INCREDIBLE. I need to make that frosting ASAP and then face plant into it! I’m feeling good about this. Really, really good about this. I’m obsessed with Trader Joe’s candy cane Joe-Joes so obviously I will have to make this recipe with candy cane Joe-Joes but I can’t wait until then. So it looks like I’ll be making this multiple times. Have you tried regular Trader Joe’s Joe-Joes? I think I have to do a side-by-side comparison but I have this sneaking suspicion that Joe-Joes are actually better than Oreos. Not that I would kick an Oreo out of my bed. Never! Trader Joe’s has been surprising me more and more recently with their generic versions – like the Quasar bar (very similar to Milky Way Midnight but way better…and bigger…and I think even cheaper? How? How do they do it? ), so good, you need to try it or their Boffo bar which I think is supposed to be like a Snickers, but I love the Quasar too much to use the candy bar part of my tummy/caloric intake to try it. And for future reference, candy cane Joe Joes do AMAZING in the freezer, so next year you can stock up. Hi Christina – I’m so glad to see you share this recipe! My son (the crazy Oreo fanatic) will just love these! Pinned and making soon (after we finish the chocolate pudding pie I just made this afternoon). ; ) Have a great weekend! Do you think I could use golden Oreos instead and just switch out the cocoa powder with extra flour? I just bought a package of golden Oreos yesterday and don’t want to buy another. That sounds great! Thank you so much. I’ll try it out soon. I just wanted to thank you so much,I nearly gave up on baking because I always had so many leftovers! Then I stumbled onto your website and tried these Amazing cupcakes!! They were so good that my Mom said they were the best cupcakes she has ever had (and that is saying something considering she is a vanilla person). So now I am planning on going to my local bookshop to see if I can order your dessert cookbook! Thanks so much!! I went through a long phase of being underwhelmed by cookies n cream. I don’t know what was wrong with me, quite honestly. I basically wasted my 20s turning my nose up at the combo. But happily, I’m back in the swing of things. These cupcakes will help me on this important journey of self discovery. I made these cookies and cream cupcakes using my very favorite vanilla cupcake recipe. It’s the one I use as a base for most of my cupcakes , and it always gives me perfect results! I forgive you for depriving us of this frosting for so long because omg now we HAVE IT!! It looks so so good! Can you make these gluten free instead? I’ve never made GF desserts and unsure how they’ll turn out substituting gluten free flour product mix to the regular all purpose flour. Thanks, Christina! I’ll have to test it out! Also, no need for eggs to this recipe right? I didn’t see it on the recipe and wanted to check! I made these yesterday for my stepdaughter’s birthday dinner. They were perfect. She is an longtime Oreo lover and the frosting was amazing. She was disappointed I didn’t have more, but truly think it was the frosting she was after. I loved that it only made 4 cupcakes and how quickly they came together. Thank you for recipe it was exactly what I needed and have always looked to your site for small batch desserts. Oh you are BRILLIANT: I’m sending this recipe to all my retired widowed and single women friends. Cupcake just makes the day go better. Do you know, everything comes in packages of 12, unless of course it’s at the huge supermarkets (shall remain unnamed) where everything comes in six dozen…so what’s a girl to do? Why you can freeze the other 11 says the helpful young woman at checkout. Have you SEEN the freezers in a senior’s apartment, I tell her? There 8 by 11 inches, and STUFFED. I look forward to more. I mean less. Hi! These look amazing! You concentrate on desserts for two….but truth be told, I use your desserts for two to feed my family of four and it is the perfect size for us!!! That way 1) I don’t have the temptation of finishing off a “regular” batch of baked goods and 2) I can bake different things more often!! Keep up the great work with your desserts for “two”!! ???????????? I feel EXTREMELY positive about four cupcakes serving one person, ahem, I mean two people. Unless my husband asks, in which case, there were only two cupcakes m’kay? I only have some of the chocolate cookie with chocolate frosting filled oreos right now, but I think we’re going to make them with those anyways and just have chocolate-chocolate ones! ^_^ I bet these would be super yummy with lots of different flavors. Absolute best cookies n cream cupcakes ever I love them!! Adorable cupcakes. My daughter will love it.